Тема в разделе "СКАМ", создана пользователем Incredible-Earnings.com, дек 19, 2018. Red Diamond - это долгосрочная высокодоходная частная кредитная программа, поддерживаемая торговлей на рынке Forex и инвестированием в различные фонды и виды деятельности. Прибыль от этих инвестиций используется для улучшения нашей программы и повышения ее стабильности в долгосрочной перспективе. The amount of 60 USD has been withdrawn from your account. Accounts: U1651590->U17180082. Memo: Shopping Cart Payment. Deposit to Red Diamond User IncredibleEarnings.. Date: 16:50 19.12.18. Batch: 240050299. The amount of 3 USD has been deposited to your account. Accounts: U17180082->U1651590. Memo: API Payment. Withdraw to IncredibleEarnings from Red Diamond.. Date: 07:08 21.12.18. Batch: 240190298. The amount of 3 USD has been deposited to your account. Accounts: U17180082->U1651590. Memo: API Payment. Withdraw to IncredibleEarnings from Red Diamond.. Date: 23:27 21.12.18. Batch: 240266831. The amount of 6 USD has been deposited to your account. Accounts: U17180082->U1651590. Memo: API Payment. Withdraw to IncredibleEarnings from Red Diamond.. Date: 19:45 29.12.18. Batch: 240916183. The amount of 3 USD has been deposited to your account. Accounts: U17180082->U1651590. Memo: API Payment. Withdraw to IncredibleEarnings from Red Diamond.. Date: 19:45 29.12.18. Batch: 240916179. The amount of 3 USD has been deposited to your account. Accounts: U17180082->U1651590. Memo: API Payment. Withdraw to IncredibleEarnings from Red Diamond.. Date: 19:45 29.12.18. Batch: 240916188. The amount of 6 USD has been deposited to your account. Accounts: U17180082->U1651590. Memo: API Payment. 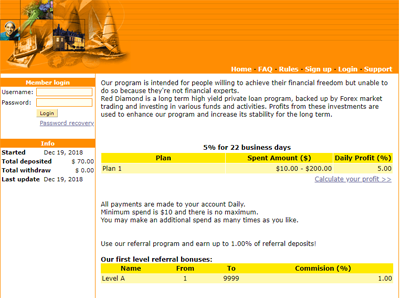 Withdraw to IncredibleEarnings from Red Diamond.. Date: 20:58 02.01.19. Batch: 241537452. The amount of 3 USD has been deposited to your account. Accounts: U17180082->U1651590. Memo: API Payment. Withdraw to IncredibleEarnings from Red Diamond.. Date: 07:04 10.01.19. Batch: 242256796. The amount of 3 USD has been deposited to your account. Accounts: U17180082->U1651590. Memo: API Payment. Withdraw to IncredibleEarnings from Red Diamond.. Date: 07:04 10.01.19. Batch: 242256798. The amount of 3 USD has been deposited to your account. Accounts: U17180082->U1651590. Memo: API Payment. Withdraw to IncredibleEarnings from Red Diamond.. Date: 16:00 11.01.19. Batch: 242420312.